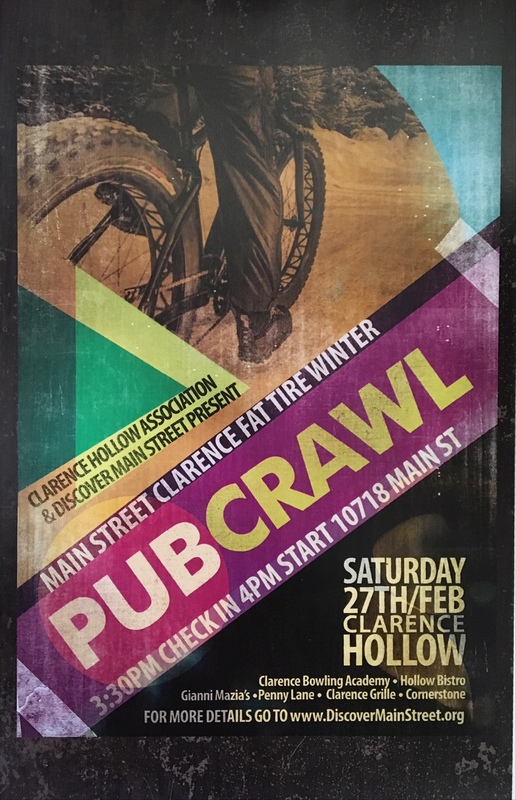 On Saturday February 27, 2016 bike riders will tour several Main Street Clarence establishments for a Fat Tire Winter Crawl. The event is free to the public, although organizers are asking riders to consider donating an item of warm clothing for the less fortunate. Event check-in will begin at 3:30 pm with the ride taking place at 4:00 pm. The goal of the ride is to create a fun, winter event that attracts people to Main Street in Clarence. With winter cycling already a proven success in the City of Buffalo, organizers are hoping bicyclists from other communities are ready to discover Main Street in Clarence. Clarence Hollow Association and Discover Main Street are sponsoring this ride. After starting at the Clarence Bowling Academy (10718 Main Street), riders will then partake in a group ride to five additional restaurants and pubs. At each stop, riders will enjoy appetizer foods and drink specials. Other participating restaurants will be Hollow Bistro (10641 Main Street), Clarence Grille (10250 Main Street), Penny Lane Café (10255 Main Street) and Gianni Mazia’s (10325 Main Street). The Cornerstone Grill (10651 Main Street) will be the final stop and will include live music. Although the ride is being heavily promoted within the fat tire rider community, casual riders are welcome, and may bring any bikes they choose. Riders must be 21+, are asked to wear helmets and are reminded to abide by the “rules of the road.” Brightly colored outerwear is encouraged. Tom’s Pro Bike and Bert’s Bikes are both lending support to the event. 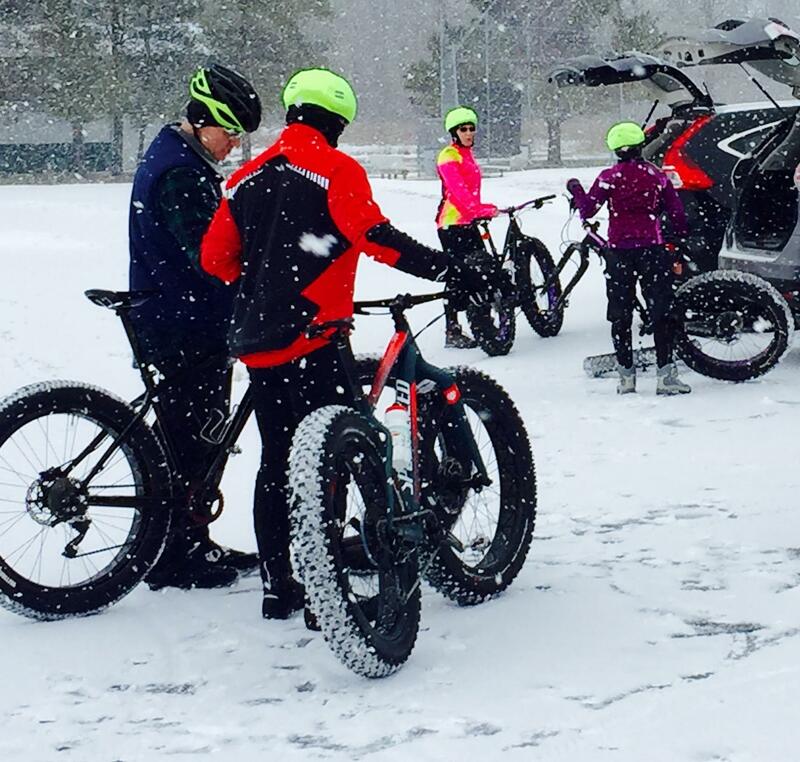 So-called “Fat Bikes” have gained popularity in recent years with the increasing interest in year-round cycling. 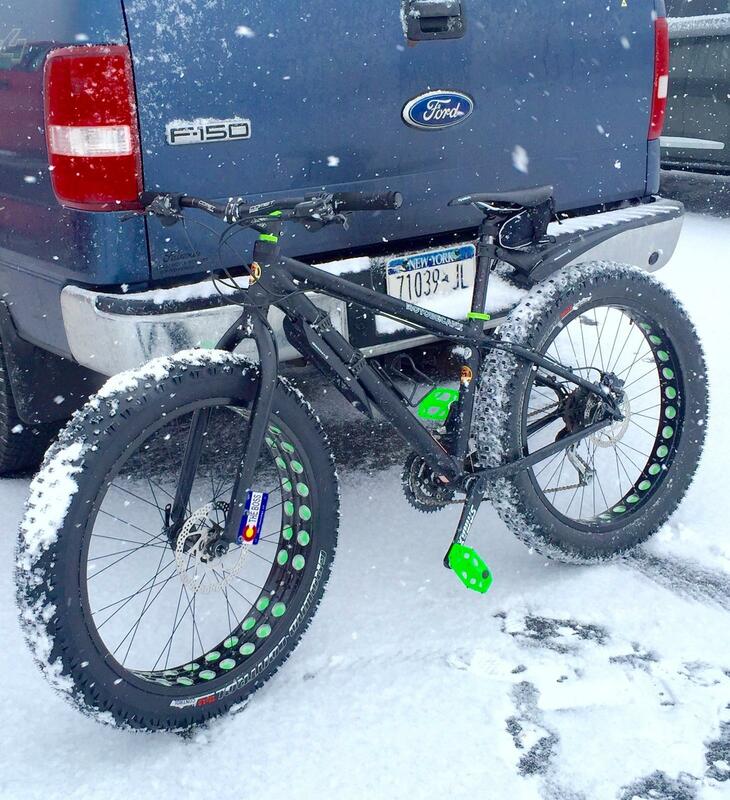 Fat tires over 3.5 inches wide make it possible to ride in the snow, as well as paved surfaces. Much of the appeal with fat tire bikes is the slow ride, where peddlers are able to soak in the scenery and enjoy conversations with their riding partners. Recognizing that increased rates of bicycle use have been shown to add to the vitality of a town, several Clarence organizations in have been working together to help make Clarence a bike-friendly community. Last October, the first-ever Discover Main Street Fun Ride attracted over 170 cyclists who rode two separate routes in an event designed to show community support for dedicated bike lanes on Main Street in Clarence. Next Next post: Penny Lane Cafe Winter Gala this Saturday night!